I am still doing short rowing and I have to tell you how I came upon this pattern. I saw a pattern for a round dishcloth and I loved how the outside was finished. The pattern was by Marg Coe and the pattern was available in the LK150 knitting machine group. I made the dishcloth on my passap out of sock yarn and it came out the size of a coaster. I have lent the sample out but will post when I get it back. I emailed Marg Coe and asked her if I could make that pattern larger because I wanted to use it as a doily and not a dish rag. It is too pretty. She emailed me back and gave me some suggestions. So that is my next project in short rowing to share with you. When she answered me she sent me this pattern and told me that it comes out rather large and it is a doily. Well I had seen this pattern in the LK150 group and that was my next mission to find it. And here it shows up in my email!! Thank you Marg! So I used a cotton yarn, tension 6 on the passap. No console is needed and it is so very,very easy. I emailed Marg and asked if I could share this pattern with you. She told me that Carole was an instructor that gave this pattern to her and told her to share it with whoever she wanted . If you would like to try this pattern, just email me. It is written for machines that can pull needles to hold. I did a sample on the Brother to see how it was made. To make it on the passap,you can’t pull the needles to hold. 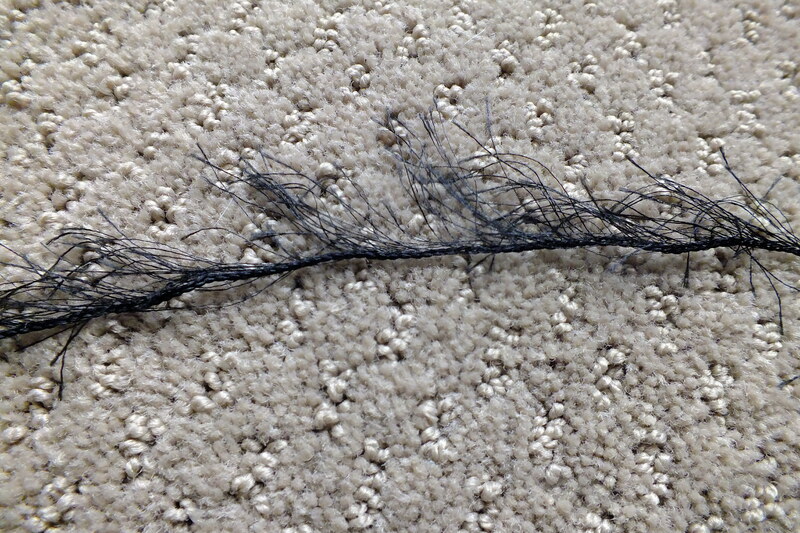 I cast on both beds , hung the comb and dropped the stitches off the back bed. I knitted several rows of waste yarn and followed her pattern . Since you can’t pull needles to hold on the passap you have to have 41 pushers under the 41 stitches. The lock has to be set to LX and GX on the back bed. When it says to pull two needles out to hold, all you have to do is lower the two pushers to non working position. There is no wrapping of stitches and it knits rather quickly. I took my time so I did not drop any stitches. There are 16 wedges and I reset the row counter after finishing one wedge. I actually got to the point of memorizing the pattern and did not have to look at the sheet. I also used the one eye transfer tool instead of a multiple one since it was too easy to drop a stitch if all did not transfer. I was going to crochet an edge but I think this is just lovely the way it is. My ADHD is taking me all over with my different crafts. 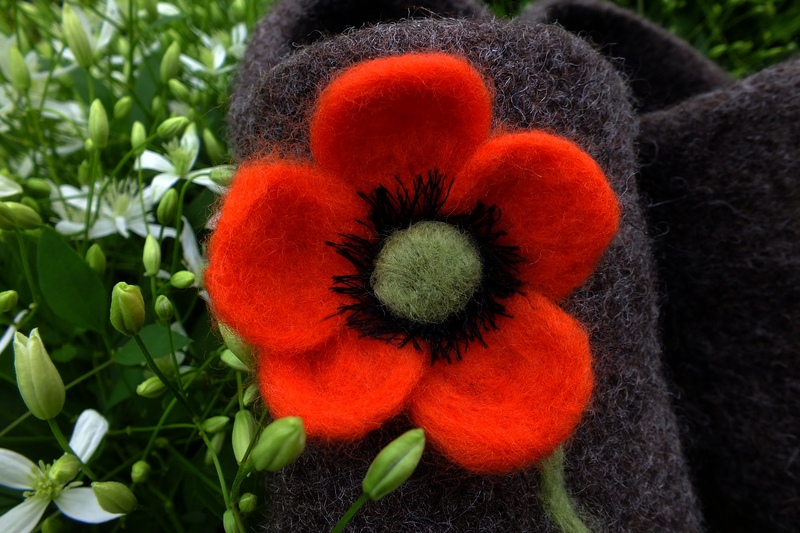 I had these slippers made quite awhile ago but I needed a product called Very Velvet for the black stamens in the flower. It was priced at 3.25 to 3.75 for about five yards I think but the shipping was $7.00!!!!!!! I don’t mind paying for some things but when the shipping is more than the product, that is ridiculous. You can mail items under 13 ounces for pennies. So these sat and then I got an idea while in JoAnn Fabric store. You will see what I used in the picture below. Didn’t cost me anything since I had some left over in my house. Took less than a half yard! I wrapped it around the green middle and needle felted it in. Then I picked the little hairs to stand up and then trimmed short. Works for me!!! 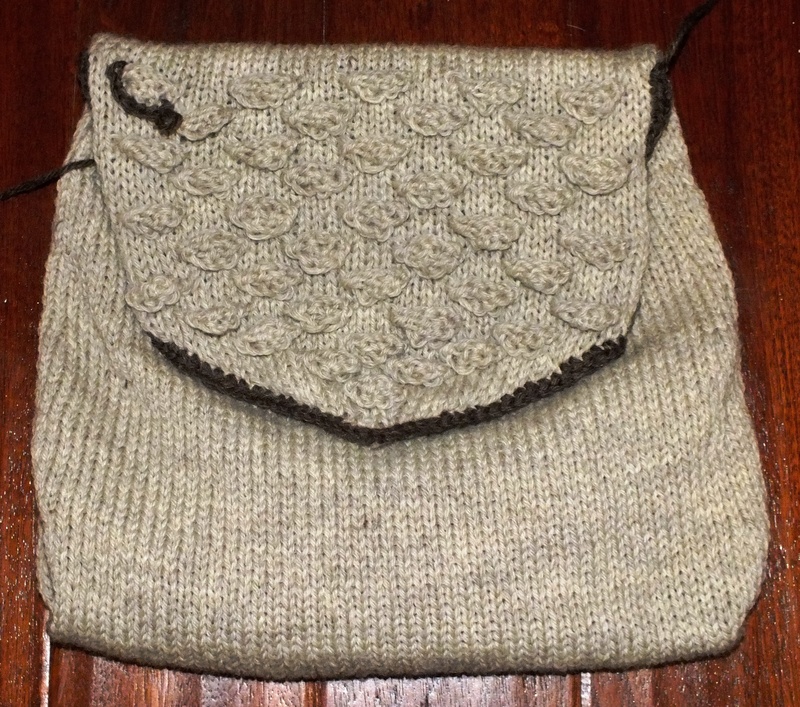 Here is a purse that I knitted and felted . Yesterday I knitted the purse. I only had this color wool and did not feel like going to the store. It looked plain and it looked like the flap was going to be too small so I played around with the brown wool. I ended up not letting the scales roll when they felted since they would roll up and I wanted it to have the scales going down. I stuffed each scale with some saran wrap so they would not lay flat and give the purse a little dimension. The purse itself is 51 stitches wide and I added 6 stitches to each side for the sides. I knitted 70 rows and decreased one stitch on each side 7 stitches in every ten rows .I made a front and a back but on the back piece, before I started the flap, I cast off 4 stitches on each side so there wouild be room for a grommet for the strap . When I got to the point of the flap I decreased down to two stitches and then I increased out for about 12 rows so that there is a backing at the point to put a metal closure in without it showing on the front. I decided on a brown leather . This purse measures 11 inches wide and 8 and 1/2 inches tall. It took the longest time to crochet around the scales and I would definitely not take an order for this one!It is for sale in my Etsy shop. I found this pattern on the internet called Knitted Christmas Bells By Jane Lake. It was a hand knitting pattern so I looked at it and it was so simple to do on the machine. It is just 15 stitches and 28 rows-no increases or decreases. I cast on the 15 stitches and you knit one row. Then on the next row you purl the first five stitches and knit the rest. So I transferred five stitches on the end to the ribber and knit one row. Then I transferred up to the main bed and knit a row. You continue those two rows for the pattern. If you want it longer, you add stitches to cast on. When you finish 28 rows you bind off and sew up seam and gather the end opposite the purl stitches. I just used a larger tension because I wanted to see what would happen when I felted it. It came out two inches high and two inches wide at the bottom of the bell. If you want the instructions, you can email me or google them.I did not save the link. When I make this again I am going to cast on with waste and ravel and take off on waste and kitchener stitch the stitches together so I don’t have a seam even though you can hardly see it on this bell. I just did an “I” cord . It could use a little red bow. I just had fun doing a needle felting design on it. Just for the heck of it I am going to put it in my Etsy store. 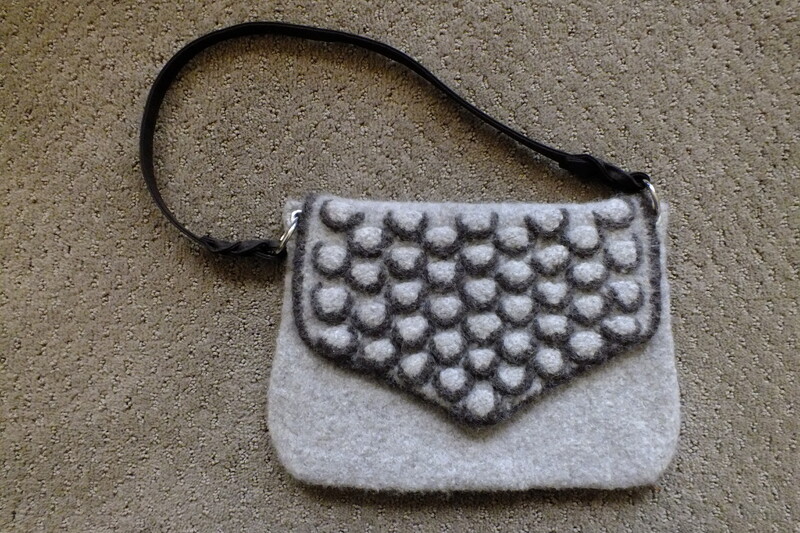 I wanted to try my Intarsia carriage on the Bulky Brother so I made this black and gray purse. I needle felted the tree in the opposite color as the background color. I used four metal grommets to hang the purse handle. The purse handle is 24 inches long and nice for an over the shoulder purse. I used a metal closure in silver. The bottom is slightly wider than the top. When I started the bottom I did half in black and gray and the other half in gray and black since the bottom becomes the front and back. However I did not allow for this on the top. I meant to fold down the tops for the closure but then the squares would not be the same. That is why I made grommets and used a handle. I knitted a seperate piece of felted fabric for the back of the clasp so it does not show on the outside. The tree roots look like Bullwinkle’s horns. LOL!!! I swear I am employed by this woman that keeps buying these wine and jelly covers from me. lol! It is a good thing though. This pattern is half of the size of the wine bottle covers. This is 49 stitches wide . I knit a picot edge and then knitted 20 rows. 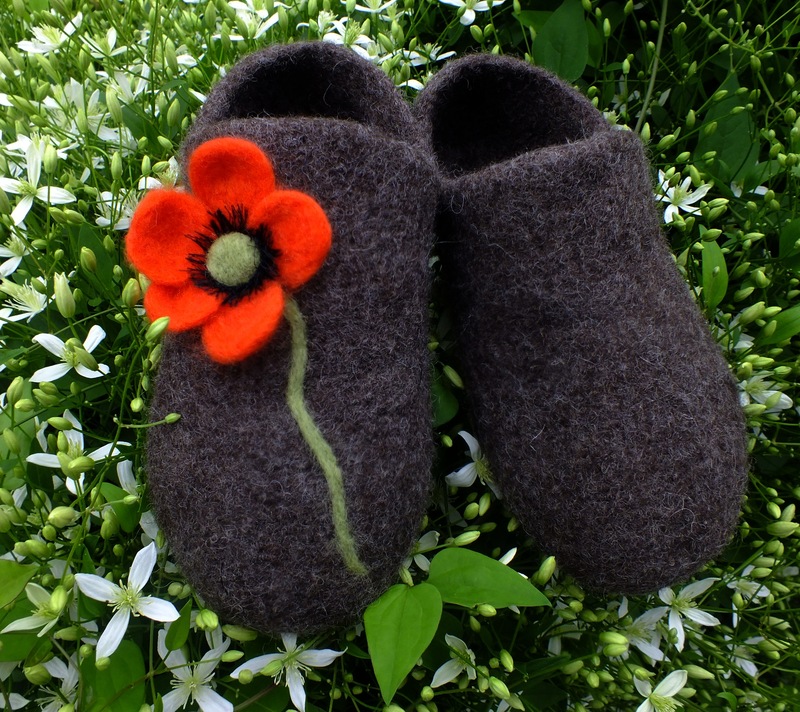 I transferred half of the stitches to the ribber and knit circular for 40 rows(80 circular) Tension dial was 8..
And here is another pair of felted slippers for my store. lol And yes, there are pink butterflies! I knitted these fingerless gloves in less than two hours. I knitted the rib. Then I placed half of the stitches on the ribber and knit circular. Since I knit circular, I could not go into ribbing so I took the glove off of the machine on waste yarn. Then I knitted the ribbing and took it off on waste yarn also. Then I used the kitchener stitch to attach the band to the glove and the thumb. The yarn is Cascade 220. I lightly felted the gloves and needle felted the dots on them. I love the feel and fit of these gloves.It is true that felting takes the scratchiness out of wool. I have a lady that buys wine bottle cover from me and she wanted a jelly jar holder. This is what I came up with. It is the same pattern but half the amount of knitted rows. I would do less on the collar but she likes them wide. I used Cascade 220 yarn. I made a row of eyelets further down to run the yarn through to snug up the jar in case it was a little smaller. This is 4 inches tall to the front V and 3 inches in width. I needle felted the stocking on.